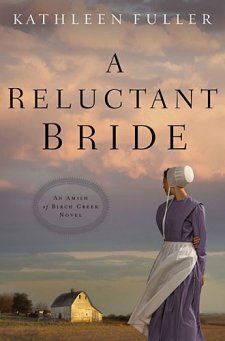 Welcome to my book review for A Reluctant Bride By Kathleen Fuller. I have to say that this is now my favorite a Amish book. I loved the whole story and its a great read. In this book you have a tragedy that has Sadie Schrock in a real problem he has never wanted to marry but because of a carriage accident that has killed her parents and left her sister in intensive care with bill adding up . Sadie finds out that her father was not as good with money as she had thought and for some reason the local Bishop will not help her with the money that was supposed to go for this kind of emergency. Sadie does not like Solomon Troyer the bishop's son because he drinks to much and assaulted her when she was a girl she does not trust him or his weaker brother but it seem she has little choice for the Bishop want her to marry one of his sons so he can get control of the store that Sadie and her sisters now own. I don't want to give to much away but this is a great book about how absolute power corrupts absolutely as well as how child abuse can occur in any place and how suffering can cause children to grow up with many problems . In Solomon that leads to drinking and abusing his brother , in Aden it turns inward and makes him fearful of everything.